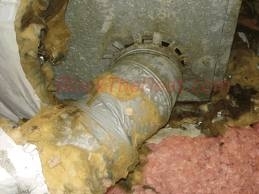 Leaky Ducts - How much energy are you losing? Wouldn't you like to put that money in your pocket? Of course your mileage may vary, and I'm quite certain it will. So this example should only be used for very rough estimates. Of course you would tend to increase the 10% number to something like 20% or even more if you go down to your crawlspace and find that some of your ducts are just hanging out, not connected to anything. That'll certainly cost you a bunch on your utilities. It happens! If you've got leaky return ducting (the ducting that takes the cooler air in your house and routes it back to the furnace), you're picking up particulates from the attic or crawlspace (or both!) like fiberglass, radon, mold, and bacterias of all sorts and depositing this junk into your home. These particulates can be deadly. Get headaches often? Respiratory problems? The other problem is that your furnace (or air conditioner) needs to work that much harder to condition the air again. If it's 20 degrees in your attic, and there is a leak in your return ducting, what normally would have been 60 - 70 degree return air now gets injected with that 20 degree air and your furnace has to work harder to heat it up. This also works in the inverse, if you send cool air through leaky ducts in your attic for air conditioning in the summer, that cool air gets injected with the 120 degree heat in the attic making the furnace work really hard to cool (and dehumidify) that air. Make sense? If you've got leaky supply ducting (the ducts that carry warm air to your rooms), you're going to get cold rooms and a warm attic or crawlspace (or both! ), venting your hard earned money right out into the atmosphere. In most cases, the fix is simple: flexible duct mastic over each and every duct joint. What's not simple is the labor. It's a miserable job crawling around in your crawlspace or attic, trust me, I know from experience. But it's absolutely necessary, I assure you. And if you don't want to do it yourself, hire a high-school kid or someone who needs the money, because, to be quite honest, it's not rocket science applying the mastic. What it takes is a person with a pulse and a willingness to get dirty for a while. How much will it cost? Well it depends, but here is a good way I've found to calculate how much time it will take. If you count all of the supply and return registers throughout your building and multiply times two, you'll have the total number of angled junctions you'll need to seal. Then, from each supply and return register, count the amount of long strides (4 ft) it takes to get from the register to the furnace. Go ahead and count those paces up and down stairs, trying to keep the pace at 4 ft. Add all of those paces and you get the total amount of straight pipe junctions you will also need to seal (assuming 4 ft sections, some homes use flexible ducting though). Add the total number of angled junctions to the total straight pipe junctions and you will have your total amount of duct joints needing to be sealed. My average is about two joints per hour (and I don't mean Ganja). So if your total count is 60, you can assume the project will take about 30 hours to complete. Pay your neighbor's kid $10/hour and it will cost you about $300, plus materials, which will cost about $30 for the duct mastic. The remainder of materials should be a good drop light and extension cord, a painter's coverall, a bandana for your head, a headlamp, a bunch of good dust masks (or even a respirator), and a box full of nitrile gloves, because you don't want to get that goop all over you. How can you tell if your ducts are leaky? Well there are many ways: the most obvious one, is the crawlspace or attic warm in the winter? If so, and there is adequate insulation in the floor or ceiling joists, you've probably got leaky ducts. If there is insulation wrapped around the ducting, look for discoloration of the insulation. This is a great indicator of leakage. 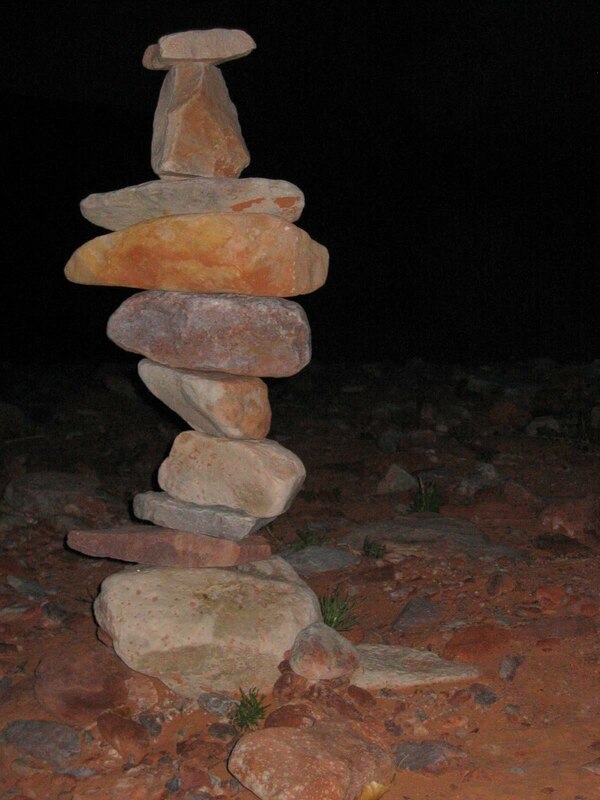 Another way to tell is to look at the joints and see if they are wrapped with duct tape. If they are, the duct tape has already failed or it will fail within the next five years or so. 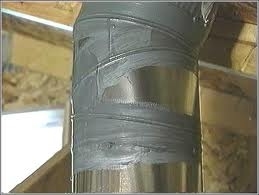 Duct tape, despite its name, is lousy for sealing ducts. In even the most excellent duct jobs I've seen, duct tape rarely lasts more than five years before it falls apart. If these inspections don't provide your answer, peel off some of the insulation at one of the angled junctions going into the floor or ceiling. Do this with the furnace cranked on so that there is air blowing through the system. Feel the joints. Do you feel air? Significant heat or cold? Keep in mind that the price of electricity and gas always goes up. As such, your calculations should extrapolate out for the next 10 years including inflation and the probable increases in your utilities. What might not look like a quick payback at first can look much more inviting this way. And what happens when the next energy crisis strikes and you're paying way too much for heat? Based on the last 40 years, I can practically guarantee there will be an energy crisis in the next 10 years. Will you be ready? And atop the discussion of the costs of energy, there is also--and the reason for my being in this business--the issue of carbon. Waste = CO2 and other greenhouse gasses (GHGs) released into our atmosphere. We're at a tipping point where energy efficiency is not only much more cost effective than manufacturing power plants, it's also the right and easiest move towards reducing GHGs. So by sealing your ducts, you're also protecting the environment of your children's future, where clean air and water are essential to a healthy existence.